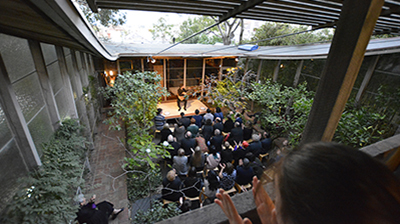 The Robin Boyd Foundation presents an extensive program of events that encourage a greater public awareness and understanding of the benefits of good design. Public lectures, seminars, and musical performances are held at Walsh Street and provide an opportunity for people to visit and experience the house. Below details the types of programs. Please register for our newsletter to be kept up to date with our ongoing events program. 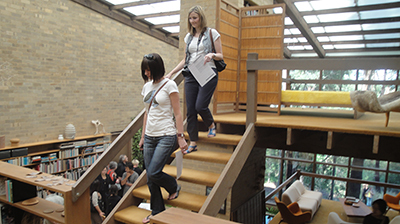 The Robin Boyd Foundation holds public Open Days in privately owned homes. These open days provide a unique opportunity for people to view and experience the design qualities of some outstanding buildings. The Open Days include buildings designed by Robin Boyd together with the work of Boyd’s colleagues and contemporaries, the work of architects whose work Boyd admired, and the work of recent and currently practicing architects whose work continues to demonstrate the benefits of good design. Public lectures and special speakers talks are often held at Walsh Street. These events are set based on a topical theme within design or architecture. 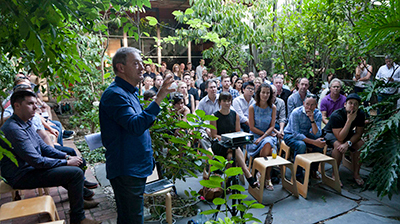 The Foundation often focuses its talks around larger Melbourne events such as the Melbourne Design Festival and the National Trust Heritage Festival. 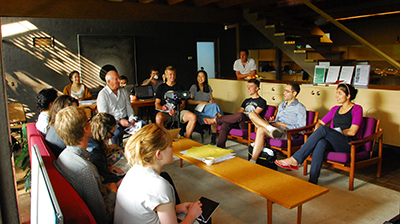 We also work with our Boyd Circle members to give them a platform to discuss projects and initiatives they are working on, as well work by architects and designers throughout Australia and internationally. Each year, in association with Melbourne School of Design, University of Melbourne, and the City of Melbourne, we host a number of residential Design Studios at Walsh Street. The design studios explore the public role of design professionals. They provide an opportunity for architecture, urban design, landscape architecture and planning students to be better equipped theoretically and practically and to develop critical thinking around design in an urban context and the role of good design for the community. 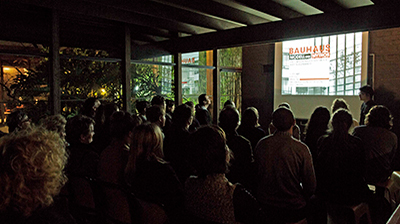 A society dedicated to the screening of documentaries and films on architecture, design and urbanism. 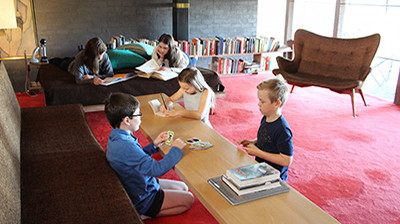 Enjoy screenings of the best in documentaries + films on architecture, design + urbanism at ‘Walsh Street’, the house designed by Robin Boyd for his family in 1958. DADo screens feature-length films as well as shorts + animations, some will be imported into Australia exclusively for our subscription only screenings, others will be classic favourites. Guest speakers will offer their own unique perspectives on the film subjects to kick off the conversation. Music was an important part of the lives of Robin and Patricia Boyd. Music was often played at Walsh Street and the Boyd Family were regular attendees at concerts and musical performances. We are very lucky to welcome Robin Boyd’s grandson to Walsh Street each year as part of our musical performance programming. Rupert Boyd is an acclaimed classical guitarist based in New York. The Foundation will host small musical performances, usually in the courtyard at Walsh Street. These performances will be open to friends of the Foundation and general public. We aim to build on 10 years of expertise and programming successes to expand our reach to the next generation. Our holiday workshops will provide an opportunity for students to explore Walsh Street, investigate the Small Homes Service and then think, speak, draw and analyse todays homes. Teaching how to observe, understand and question the decisions we make. Instead of how big is your home? the question will become how smart are our homes? We are currently seeking funding to enable us to facilitate this program in 2017.